Ready to jazz up your KDE desktop—get KDE 2.0. The GNOME team bring us up-to-date on the progress of this popular desktop environment. The first in a series by our favorite artist to take a look at the most commonly used window managers. 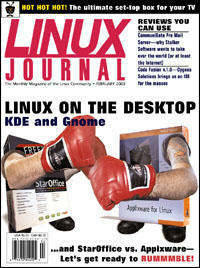 Office suites are the mainstay application for any OS; Linux has two competing for your business. How to survive without Microsoft Word. An introduction to a command-line program for matrix manipulation. If you have trouble remembering where you are going, this clever program can help you find your way. How to install Linux on your Power Macintosh to gain a robust alternative to the MacOS. Mr. Adler tells us about a first-of-its-kind conference. The ultimate in recording television programs, TiVo is a set-top box that does everything for you. Data on Macintosh disks can be read into Linux quite easily with this tool package. Come up to the lab and see what's on the slab—I mean, slide. Mark talks about his crazy multi-boot computer, which does have some practical value. If you are tired of the complexity of configuring PnP devices for Linux, you can look forward to some relief from the 2.4 kernel release. A discussion of the operation, advantages and flaws of an experimental extension for the TCP protocol. The authors have studied five libraries which can be used for multi-thread applications and herein present the results. The building blocks for a secure and trustworthy computer platform.